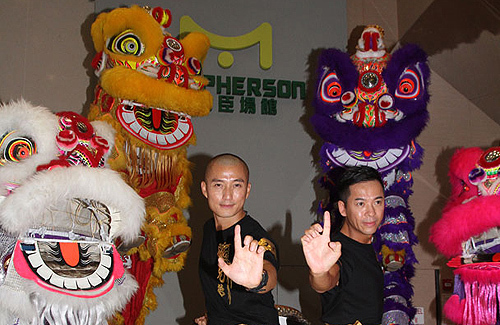 TVB artistes Joel Chan (陳山聰) and Derek Kok (郭政鴻) recently attended a lion dance event hosted by Adidas. The two best friends performed a lion dance together and revealed that they have established an association to promote lion dancing events to the masses. Contrary to his sophisticated appearances in dramas, Joel said he has been learning lion dance since he was three years old. Derek said he first started lion dancing when he was nine years old, and joked that Joel, who is 12 years younger, was his senior. The two TVB actors became good friends after discovering that they had a common interest in lion dancing. They thought about starting a lion dance team after they retire, but decided to jumpstart the plans after finding inspiration from an interview they did together last year. Newcoming singer-songwriter Yuki Lovey (勞嘉怡) was also invited to the lion dance event. She revealed that she is currently recording her debut self-produced EP and plans to release it in late November. She will be holding her first mini-concert at the end of the year and is currently studying visual arts so she can contribute in her concert’s stage and lighting design. Interestingly, Derek and Joel are always friends even during the time Joel dated Florinda. Best friends cos they are both scums. One for ditching his wife for a rich girl, the other for concealing his martial status and going after another woman. Pity though, both are good actors. didn’t know derek did that. oh what a pity. lost all faith in joel after florinda. How do you know that all of those tabloids are correct? Didnt Joel divorce before he dated Florinda and have Joyce ever admitted that Derek went after her? I like neither, their persons as well as their acting. Both are cheaters. Yup, they both are cheaters. Don’t care too much for these two, however Joel chan has the look and he can act. He has more chances with TVB than the other guy. 😀 🙁 LOL! @kiwi: I agree about Joel. He seemed promising before the whole Florinda ordeal. Hopefully he can bounce back. As for Derek, he’s over his prime time at TVB; unless he can pull a Wayne-stunt. He thought he latched onto a goldmine and can eat soft rice for the rest of his life. Too bad the spell broke and he got the boot. No respect for this type of men. It’s good that the spell broke and he got booted back to TVB. No respect for this type of guy but he still needs to make a living. 😀 🙁 LOL!